In an average workday I would say I listen from anywhere to 5 to 12 records a day- easy. Unfortunately much of the time I am only half listening, forget what I have thrown on, or tune out whatever I intended to listen to in a matter of minutes. 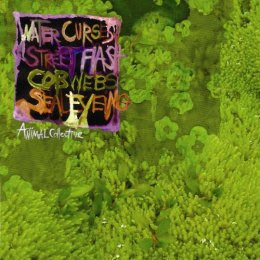 Today I put Animal Collective's Water Curses EP on and about 2 minutes in I found myself thinking GOD, ANOTHER BAND THAT WANTS TO BE ANIMAL COLLECTIVE!!!! I am utterly over this. And then I quickly realized, ooops, this is Animal Collective and they have ever right to sound like themselves. It isn't the band's fault that every other new band seems to be borrowing heavily from their trademark tribal atmospheric ethereal melodies. The four songs found on Water Curses are perfect stepping stones from Strawberry Jam, moving farther away from their jam band drum circle tendencies and closer to a more structured, more palatable mosaic of textured sounds. The song "Cobwebs" repeats the line ping pong style "I'm not going underground" and I can attest that they speak the truth. Animal Collective have spun a delicate silvery psychedelic web between the world of cult following and the mainstream.